Our next door neighbours have been renovating their house for about 7 months now. It’s not a particularly big house, and so it does seem to have dragged on somewhat. For about 5 months of that time, their renovations ran concurrently with another lot of neighbours who were also renovating their house. The resulting noise was near-continuous, very tiresome and made basic tasks – like the kids’ homework and revision, for example – very difficult. I have video of my daughter swimming in the pool in late November with a background of pure, ongoing angle grinder. It’s gorgeous. The concurrent 5 months renovations finished and those neighbours invited everyone around for drinks to say sorry for all the noise. Next door though, work continued well into December. And then it went all quiet over Christmas. And then the neighbours moved in. And we thought it was all done. But, no. In what I can only imagine is now some sort of re-renovation (because there surely can’t be anything original left to renovate now), it’s started afresh: drills, saws – and that infamous angle grinder – they’re all back. Add to that that another lot of neighbours have got the tree surgeons around today* (although this is clearly just a one off thing), and you’ll see why I’m hiding in the study, with the speakers turned up to (near) full volume, using my stereo to drown out the stereo sound outside. I may also be singing. A bit. * there’s got to be a joke about a trio of Irish doctors in there somewhere, right? 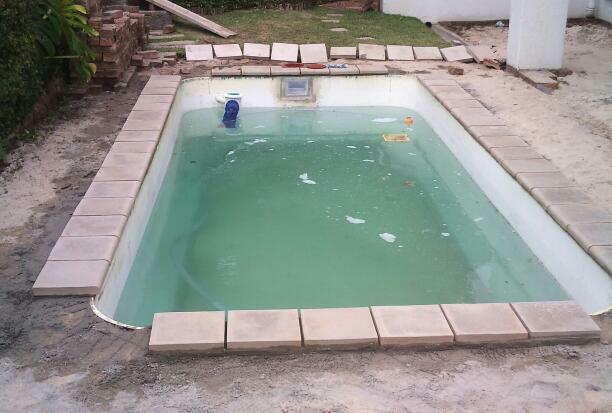 Back in December when we arranged the repairs to the pool and the pool area, the weather was pretty rubbish in Cape Town. But we couldn’t have foreseen that we’d choose to have it done during the hottest week in living memory. But the summer months have weeks that are in the mid-20s, which would have been fine. Right now, in an effort to get any sort of comfort, I’m writing this from next door’s pond.